Astronomers using ESOs Very Large Telescope have discovered a pair of stars orbiting each other at the centre of one of the most remarkable examples of a planetary nebula. The new result confirms a long-debated theory about what controls the spectacular and symmetric appearance of the material flung out into space. The results are published in the 9 November 2012 issue of the journal Science. Planetary nebulae  are glowing shells of gas around white dwarfs Sun-like stars in the final stages of their lives. Fleming 1 is a beautiful example that has strikingly symmetric jets  that weave into knotty, curved patterns. It is located in the southern constellation of Centaurus (The Centaur) and was discovered just over a century ago by Williamina Fleming , a former maid who was hired by Harvard College Observatory after showing an aptitude for astronomy. The team used ESOs VLT to study the light coming from the central star. They found that Fleming 1 is likely to have not one but two white dwarfs at its centre, circling each other every 1.2 days. Although binary stars have been found at the hearts of planetary nebulae before, systems with two white dwarfs orbiting each other are very rare . The origin of the beautiful and intricate shapes of Fleming 1 and similar objects has been controversial for many decades, says Henri Boffin. Astronomers have suggested a binary star before, but it was always thought that in this case the pair would be well separated, with an orbital period of tens of years or longer. Thanks to our models and observations, which let us examine this unusual system in great detail and peer right into the heart of the nebula, we found the pair to be several thousand times closer. While stars are spherical, many of these planetary nebulae are strikingly complex, with knots, filaments, and intense jets of material forming intricate patterns. Some of the most spectacular nebulae including Fleming 1 present point-symmetric structures . For this planetary nebula it means that the material appears to shoot from both poles of the central region in S-shaped flows. This new study shows that these patterns for Fleming 1 are the result of the close interaction between a pair of stars the surprising swansong of a stellar couple. This is the most comprehensive case yet of a binary central star for which simulations have correctly predicted how it shaped the surrounding nebula and in a truly spectacular fashion, explains co-author Brent Miszalski, from SAAO and SALT (South Africa). The pair of stars in the middle of this nebula is vital to explain its observed structure. As the stars aged, they expanded, and for part of this time, one acted as a stellar vampire, sucking material from its companion. This material then flowed in towards the vampire, encircling it with a disc known as an accretion disc . As the two stars orbited one another, they both interacted with this disc and caused it to behave like a wobbling spinning top a type of motion called precession. This movement affects the behaviour of any material that has been pushed outwards from the poles of the system, such as outflowing jets. This study now confirms that precessing accretion discs within binary systems cause the stunningly symmetric patterns around planetary nebulae like Fleming 1. Our results bring further confirmation of the role played by interaction between pairs of stars to shape, and perhaps even form, planetary nebulae, concludes Boffin. Planetary nebulae have nothing to do with planets. The name arose in the eighteenth century as some of these objects resembled the discs of the distant planets when seen through small telescopes. Jets are outflows of very fast-moving gas that are ejected from the core regions of planetary nebulae. They are often collimated the material comes out in parallel streams meaning that they spread out only very slightly as they propagate through space. Fleming 1 is named after Scottish astronomer Williamina Fleming, who discovered it in 1910. Initially working as a maid to the director of the Harvard College Observatory in the 1880s, Fleming was later hired to process astronomical data at the observatory as one of the Harvard Computers, a group of skilled female workers carrying out mathematical calculations and clerical work. During her time she discovered and was credited for numerous astronomical objects, including 59 gaseous nebulae, over 310 variable stars, and 10 novae. This object also has many other names, including PN G290.5+07.9, ESO 170-6 and Hen 2-66. The team studied the stars using the FORS instrument on the Very Large Telescope at ESOs Paranal Observatory in Chile. As well as taking images of the object they also split the light up into its component colours to obtain information about the motions as well as the temperature and chemical composition of the central object. The primary and secondary stars were found to have approximately 0.5 to 0.86 and 0.7 to 1.0 times the mass of the Sun, respectively. The team was able to rule out the possibility of there being a normal star like our Sun in the binary by analysing the light from the two stars, and studying the systems brightness. As the system rotates its brightness only changes by tiny amounts. A normal star would have been heated by its hot white dwarf, and because it would be always presenting the same face to its companion (as the Moon does with the Earth), it would present a hot and luminous and cold and dark side, easily seen as a regular variation in brightness. The central object is thus very likely a pair of white dwarfs a rare and exotic find. In this case each part of the nebula has an exact counterpart at the same distance from the star, but in the opposite direction the kind of symmetry shown by the court cards in a conventional pack of playing cards. In PN images it doesn’t get anymore cinematic than this. Looks like you’re living the jet set lifestyle. Excellent choice! 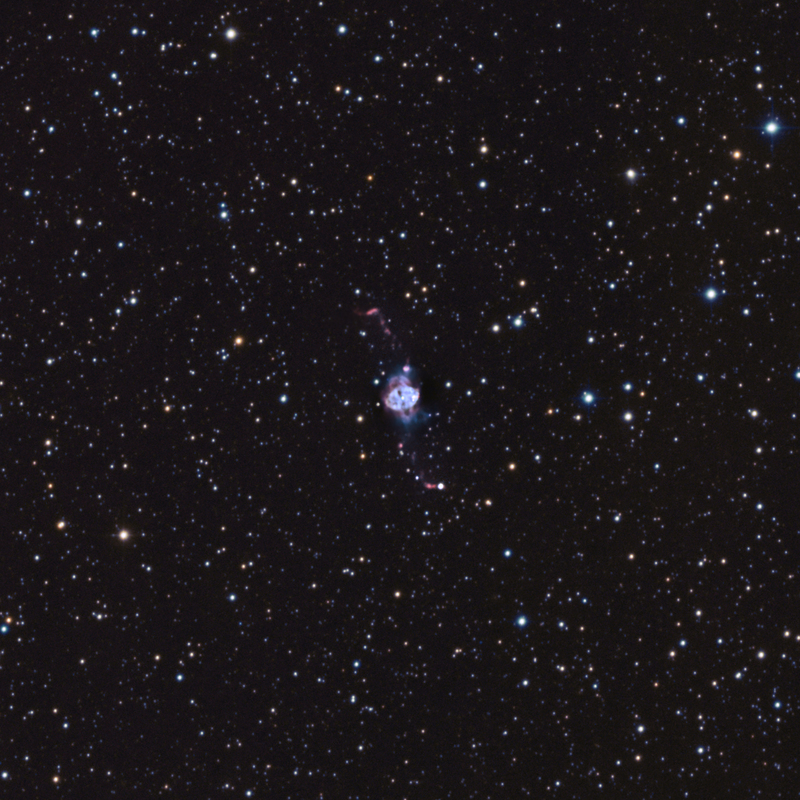 I agree to Sakib that this nebula transmits dynamism… Beautiful object and excellently processed. Congratulations!